A Citibank branch in New York. AIG isn't the only bailed-out financial firm paying big bucks to managers who helped steer their company to near collapse. Citigroup has pledged millions of dollars in bonuses to senior executives for the next few years, despite lawmakers efforts to eliminate such payments. But Citi finalized its bonus program shortly before the new rules were introduced. That might make the payments permissible, though they could be made almost worthless by new tax rules just passed by the House of Representatives and headed for consideration in the Senate. Even so, Citigroup's move in January to set in place bonus payments for years to come raises questions about whether it was trying to evade compensation rules it knew were coming. Under Citi's proposed compensation plan, three of the company's top five executives would be paid a total of nearly $12.5 million in cash bonuses over the next five years. 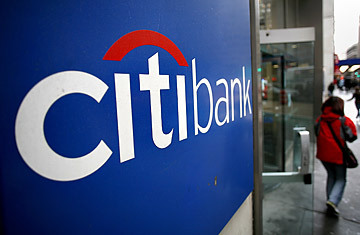 One of the executives, James Forese, is a co-head of Citi's Institutional Client Group, which lost $20 billion in 2008. Forese is rewarded $5 million under the plan. At least 15 other Citi executives are in line for multimillion-dollar payouts. Citi declined to say how much in total it has promised under the plan. According to a proxy statement Citi filed with the Securities and Exchange Commission, the company finalized its bonus plan on Jan. 14. Twelve days later an amendment barring such payments was inserted by the House of Representatives into the $787 billion fiscal stimulus bill, which went into effect on Feb. 17. The revelations about Citi's bonus plan come at a time when anger over executive pay, particularly in the troubled financial sector, is boiling over. On Thursday, the House overwhelmingly passed a bill that would impose a 90% income tax on all compensation over $250,000 earned by employees at banks that have received more than $5 billion in bailout funds. The Senate is working on its own bill to raise taxes on highly compensated bankers. President Barack Obama indicated he would sign legislation that curtails bonuses.